Are you ready to celebrate the 4th of July? 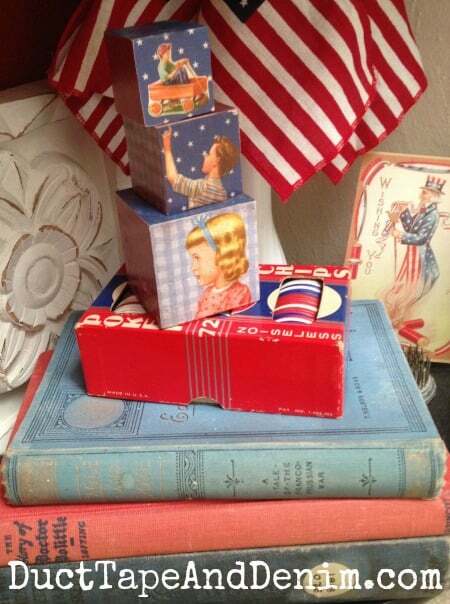 Today I’m sharing how I made some patriotic decorations out of wooden blocks. I bring these out in May before Memorial Day and leave them up through most of July. 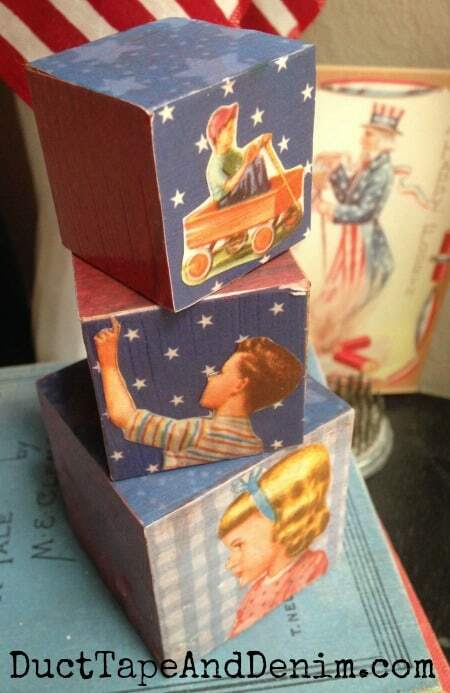 In my life before creating jewelry and blogging I sold vintage collectible children’s books on eBay. There’s a long story behind that, too, but I did it while we were homeschooling and we owned a LOT of books! The girls and I went to every library sale we could find. I would even buy books that were falling apart if I loved the text and illustrations in them. That’s where these illustrations came from. (Don’t worry, I didn’t cut up a book still in good condition!) They were from an old reader that had a worn through cover and looked like it had been used as a coloring book by a toddler. But I was able to save a lot of great illustrations! 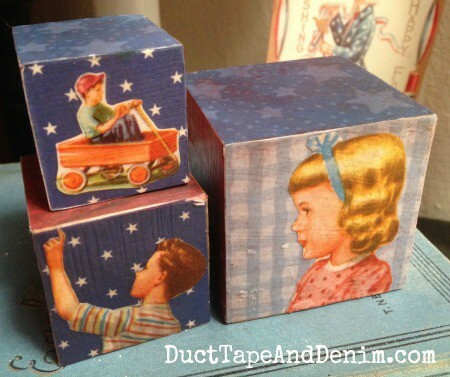 I bought the blocks in graduated sizes from a craft store, cut scrapbook paper to fit, and decoupaged it on with ModPodge. Then I trimmed some of my favorite illustrations from the reader to fit one side on each block and decoupaged them on, too. Now they take their place just before each Memorial Day and stay up until after July 4th with all my other vintage patriotic decor. And I still have just a ‘few’ vintage books in my collection, too. These were also featured in Somerset Holidays and Celebrations! What a fun way to dress up those blocks! I love the vintage look. Thanks for sharing at Snickerdoodle. Pinning. A fun and cute project. love your project. Thanks for sharing at DI&DI. Love the blocks! Thanks for sharing at the Inspiration Spotlight party. See you again soon.